Today is the anniversary of the accession (686 CE) of Yuknoom Yich’aak K’ahk’ or Yuknoom Ixquiac (“Jaguar Paw Smoke”; born on October 6, 649 CE) as the Mayan king of the Kaan kingdom, which had its capital at Calakmul during the Classic Period of Mesoamerican chronology. This king acceded in his thirty-sixth year, but there are indications that he effectively governed the kingdom for a substantial period before this on behalf of the previous king, Yuknoom the Great. The latter, who may have been Yuknoom Yich’aak K’ahk’s father, lived well into his eighties and may have been incapacitated in his later years. The inscription of Stela 9, from 662 CE in Calakmul, goes into great detail about the birth of Yuknoom Yich’aak K’ahk’ and accords him a full royal title. Thus, military victories in the following years, as well as assertions of the Kaan dynasty’s hegemony, might tentatively be ascribed to Yich’aak K’ahk’. These include military triumphs over rival kingdom Tikal in 677 and (quite probably) 679; supervision of the accessions of kings of Moral and Cancuen in 662 and 677 respectively; the dispatching of Lady Six Sky from Dos Pilas to re-seed the dynasty of Naranjo in 682, and a lieutenant’s action expressive of Kaan overlordship at Piedras Negras in 685. Yich’aak K’ahk’s accession was recorded at El Peru by local ruler K’inich Bahlam and at Dos Pilas by B’alaj Chan K’awiil. At Naranjo, the son of Lady Six Sky, K’ak’ Tiliw Chan Chaak, acceded in 693. In 695 Calakmul suffered a military defeat at the hands of Tikal and it was believed that the king was killed or captured in that battle. A stucco scene at Tikal shows a prisoner being “adorned” for sacrifice and names the Kaan king in a related caption; the text is damaged and in its current condition it allowed for the possibility that it referred to Yich’aak K’ahk’ himself instead of him being the overlord of the prisoner to be killed. A new find at La Corona has revealed that the king survived at least until 696, when he made a visit to that town. There are reasons to believe that Yich’aak K’ahk’ is buried in Tomb 4 within Calakmul’s Structure 2. Yich’aak K’ahk’s monument program does not even begin to compare with that of his immediate predecessor, and the two stelae that still stand (including Stela 105 from 692) are located far from the site core in the Northeast Group. 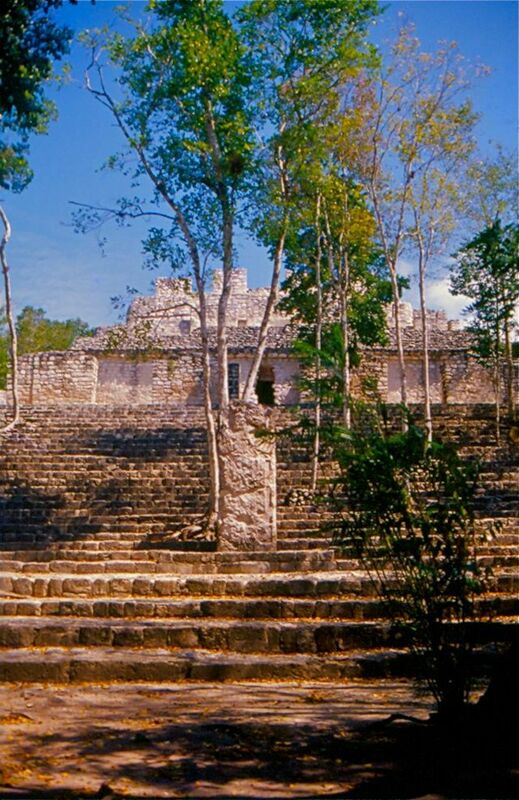 Calakmul is located in Campeche state in southeastern Mexico, about 35 kilometers (22 mi) north of the border with Guatemala and 38 kilometers (24 mi) north of the ruins of El Mirador. The ruins of El Tintal are 68 kilometres (42 mi) to the southwest of Calakmul and were linked to both El Mirador and Calakmul itself by causeway. Calakmul was about 20 kilometers (12 mi) south of the contemporary city of Oxpemul and approximately 25 kilometers (16 mi) southwest of La Muñeca. The city is located on a rise about 35 meters (115 ft) above a large seasonal swamp lying to the west, known as the El Laberinto bajo (Spanish used in the region for a low-lying area of seasonal marshland).This swamp measures approximately 34 by 8 kilometers (21.1 by 5.0 mi) and was an important source of water during the rainy season. The bajo was linked to a sophisticated water-control system including both natural and artificial features such as gullies and canals that encircled a 22-square-kilometre (8.5 sq mi) area around the site core, an area considered as Inner Calakmul. The location of Calakmul at the edge of a bajo provided two additional advantages: the fertile soils along the edge of the swamp and access to abundant flint nodules. The city is situated on a promontory formed by a natural 35-metre (115 ft) high limestone dome rising above the surrounding lowlands. This dome was artificially leveled by the Maya. During the Preclassic and Classic periods settlement was concentrated along the edge of the El Laberinto bajo, during the Classic period structures were also built on high ground and small islands in the swamp where flint was worked. At its height in the Late Classic period the city is estimated to have had a population of 50,000 inhabitants and to have covered an area of over 70 square kilometers (27 sq mi). The city was the capital of a large regional state with an area of about 13,000 square kilometers (5,000 sq mi). During the Terminal Classic the city’s population declined dramatically and the rural population plummeted to 10% of its former level. The Emblem Glyph of Calakmul has a greater distribution than the Emblem Glyph of any other Maya city. The Glyph is also found in more hieroglyphic texts than any other Emblem Glyph, including that of Tikal. Calakmul administered a large domain marked by the extensive distribution of their emblem glyph of the snake head sign, to be read “Kaan.” Calakmul was the seat of what has been dubbed the Snake Kingdom. At times the city had governance over places as far away as 150 kilometers. The kings of Calakmul were known as k’uhul kan ajawob (“Divine Lords of the Snake Kingdom”). The history of the Maya Classic period is dominated by the rivalry between Tikal and Calakmul, likened to a struggle between two Maya “superpowers.” Earlier times tended to be dominated by a single larger city and by the Early Classic Tikal was moving into this position after the dominance of El Mirador in the Late Preclassic and Nakbe in the Middle Preclassic. 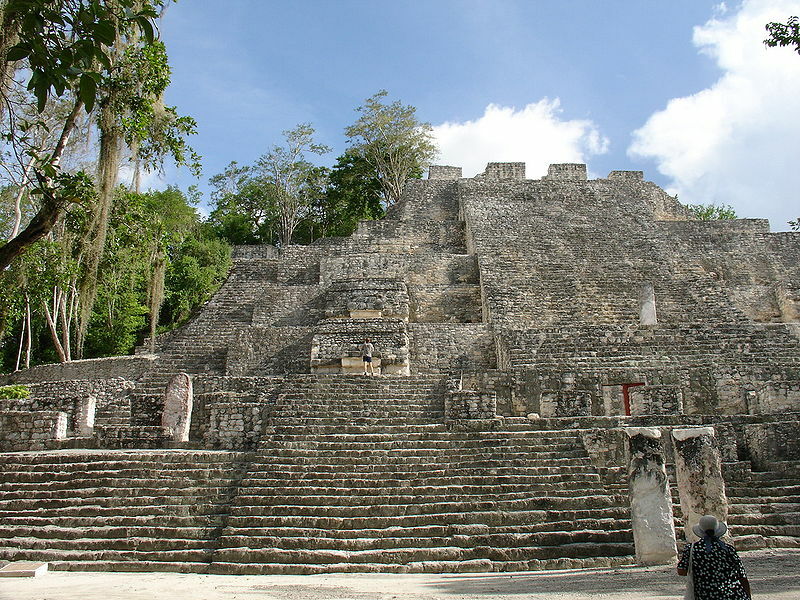 However Calakmul was a rival city with equivalent resources that challenged the supremacy of Tikal and engaged in a strategy of surrounding it with its own network of allies. 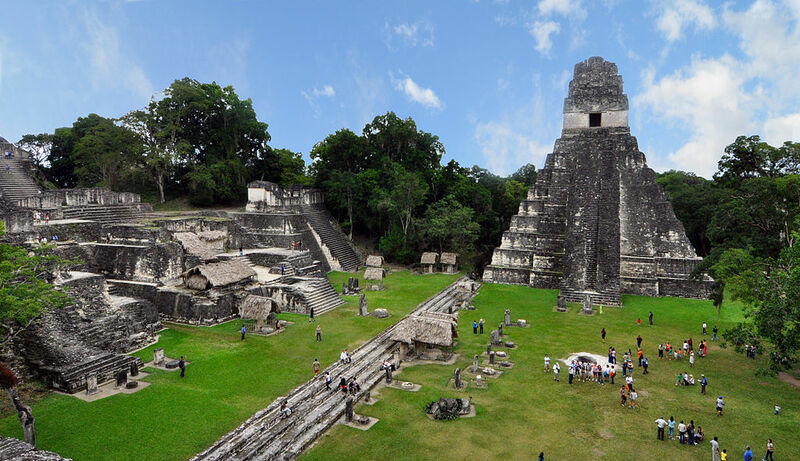 From the second half of the 6th century through to the late 7th century Calakmul gained the upper hand although it failed to extinguish Tikal’s power completely and Tikal was able to turn the tables on its great rival in a decisive battle that took place in AD 695. Half a century later Tikal was able to gain major victories over Calakmul’s most important allies. Eventually both cities succumbed to the spreading Classic Maya collapse. Yuknoom Che’en II died in his eighties, probably at the beginning of 686. When he died, Calakmul was the most powerful city in the central Maya lowlands. Yuknoom Yich’aak K’ak’ succeeded Yuknoom Che’en II, his crowning on 3 April 686 was recorded on monuments at Dos Pilas and El Peru. He was born in 649 and was likely to have been the son of his predecessor. He already held high office before he was named king and may have been responsible for the major successes of the latter part of Yuknoom Che’en II’s reign. He retained the loyalty of K’inich B’alam of El Peru and B’alaj Chan K’awiil of Dos Pilas and gained that of K’ak’ Tiliw Chan Chaak in 693, when he was installed on the throne of Naranjo at the age of five. However, the texts on sculpted monuments do not reveal the full complexity of diplomatic activity, as revealed by a painted ceramic vase from Tikal, which depicts an ambassador of Calakmul’s king kneeling before the enthroned king of Tikal and delivering tribute. Just four years later, in August 695, the two states were once again at war. Yuknoom Yich’aak K’ak’ led his warriors against Jasaw Chan K’awiil I in a catastrophic battle that saw the defeat of Calakmul and the capture of the image of a Calakmul deity named Yajaw Maan. 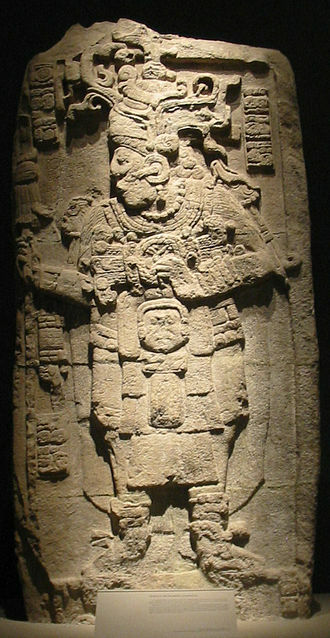 It is unknown what happened to Yuknoom Yich’aak K’ak’; a stucco sculpture from Tikal shows a captive and the king is mentioned in the accompanying caption but it is not certain if the captive and the king are the same person. This event marked the end of Calakmul’s apogee, with diplomatic activity dropping away and fewer cities recognizing Calakmul’s king as overlord. 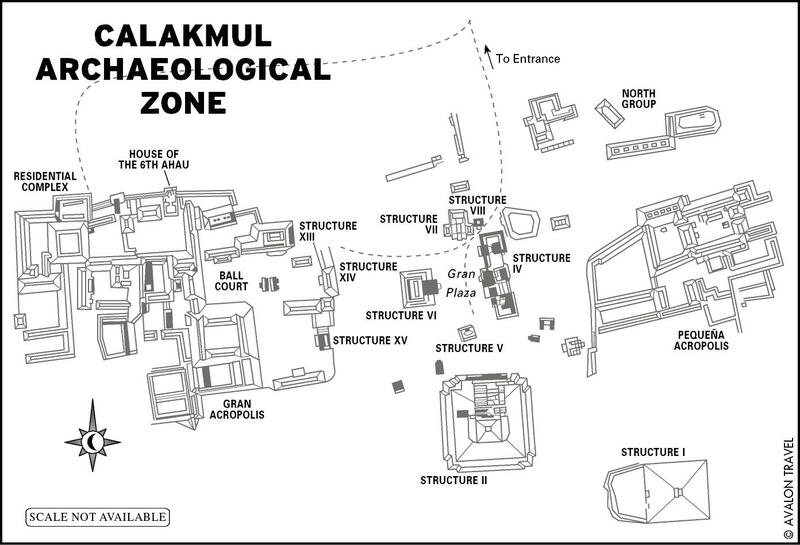 No stelae remain standing in the site core recording Yuknoom Yich’aal K’ak, although there are some in the Northeast Group and 2 broken stelae were buried in Structure 2. Tomb 4 was set into the floor of Structure 2B in the 8th century and is the richest burial known from Calakmul. The tomb contained a male skeleton wrapped in textiles and jaguar pelts that were partially preserved with resin. The tomb contained rich offerings that included jade ear ornaments handed down from the Early Classic, a jade mosaic mask, shell and bone beads, spiny oyster shells, eccentric obsidian blades, fine ceramics and the remains of wooden objects. One of the ceramics was a plate with a hieroglyphic text that specifically named king Yuknoom Yich’aak K’ak’ as its owner. The remains and the offering were placed in an arched wooden bier carved with elaborate decoration and hieroglyphs that was painted in a variety of colors. The bier has almost completely decayed but left an impression in the mud packed around it. Due to the plate and the possible association of Stelae 115 and 116 with the burial the tomb is believed to be that of the late 7th-century king Yuknoom Yich’aak K’ak’. Maya diet focused on four domesticated crops (staple crops): maize, squash, beans (typically Phaseolus vulgaris) and chili peppers. The first three cultivars are commonly referred to in North America as the “Three Sisters” and, when incorporated in a diet, complement one another in providing necessary nutrients. 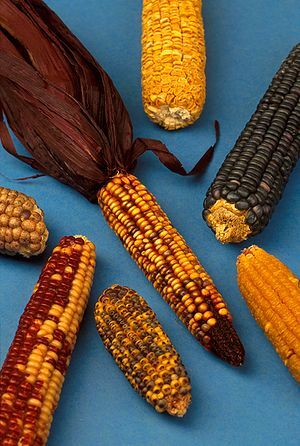 A full description of Three Sisters cultivation may be found here: http://www.bookofdaystales.com/dia-de-la-raza/ Among the three, maize was the central component of the diet of the ancient Maya, and figured prominently in Maya mythology and ideology. Maize was used and eaten in a variety of ways, but was always nixtamalized. Nixtamalization (ugh! ), is a procedure whereby maize is soaked and cooked in an alkaline solution. This releases niacin, a necessary B vitamin (vitamin B3) that prevents pellagra and reduces incidents of protein deficiency. Once nixtamalized, maize was typically ground up on a metate (grinding stone) and prepared in a number of ways. Tortillas, cooked on a comal (baking stone)and used to wrap other foods (meat, beans, etc. 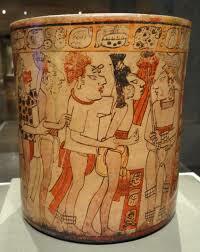 ), were common and are perhaps the best-known pre-Columbian Mesoamerican food. 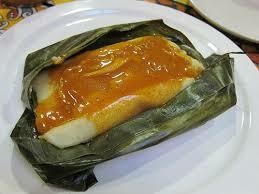 Tamales consist of corn dough, often containing a filling, that are wrapped in a corn husk and steam-cooked. Both atole and pozole were liquid based gruel-like dishes that were made by mixing ground maize with water, with atole being denser and used as a drinking source and pozole having complete big grains of maize incorporated into a turkey broth. Though these dishes could be consumed plain, other ingredients were added to diversify flavor, including chili peppers, cacao, wild onions and salt. Tamales, tortillas, beans, pozole, etc. all have analogs in modern Mayan cooking, and variants can be found across Mexico and up into the U.S. southwest. I’ve already given recipes for these, so below I give a post-Columbian recipe for tripe, variants of which are also found across Mexico. Several different varieties of beans were grown, including pinto, red, and black beans. Other cultivated crops, including fruits, contributed to the overall diet of the ancient Maya, including tomato, chile peppers, avocado, breadnut, guava, soursop, mammee apple, papaya, pineapple, pumpkin, sweet potato, and Xanthosoma. Chaya was cultivated for its green leaves. Chayote was cultivated for its fruit, and its tender green shoots were used as a vegetable. Various herbs were grown and used, including vanilla, epazote, achiote (and the annatto seed), canella, hoja santa (Piper auritum), avocado leaves, garlic vine, Mexican oregano, and allspice. Hunting supplied the Maya with meat, though several animals, such as dog and turkey, may have been domesticated. Animals hunted for meat, as well as for other purposes, include deer, manatee, armadillo, tapir, peccary, monkey, guinea pig and other types of fowl, turtle and iguana. The Maya diet was also supplemented by the exploitation, at least in coastal areas, of maritime resources, including fish, lobster, shrimp, conch, and other shellfish. The Mayans are believed to be the first people to have discovered and cultivated the cacao plant for food. 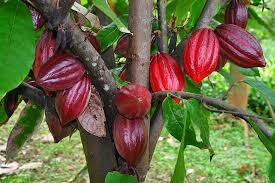 The cocoa beans were ground up mixed with chili peppers, cornmeal and honey to create a drink called xocolatl. Only the rich and noble could drink this. They also used cacao beans as ceremonial sacrifices to their gods. Tripe was not eaten by the Maya until Europeans introduced cows and sheep, but it is now extremely popular. 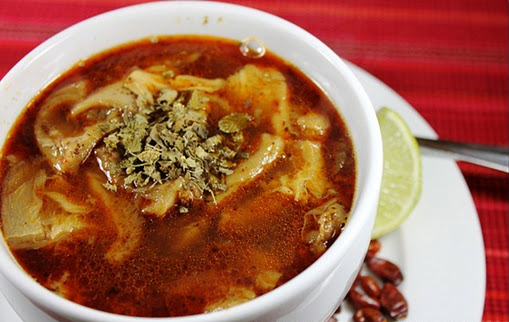 Mondongo en Kabik, a red mondongo (tripe soup), is the most common in Yucatan. This version is adapted from Diana Kennedy’s marvelous compendium Mexican Regional Cooking The main herbal ingredient in this soup is epazote which can be hard to come by. It is very common in Mexican cooking, where it is a typical flavoring for beans (supposedly because it reduces flatulence!). It can sometimes also be found under the names goosefoot, Jerusalem oak, lamb’s quarters, Mexican tea, wormseed, or stinkweed. Fresh epazote has dark green leaves with serrated edges and has a distinctive bitter flavor. If you cannot find fresh, then the dried version is acceptable although it is not as complex in flavor. Dried epazote is also difficult to find, but good Hispanic markets usually carry it. You may substitute cilantro or savory for epazote, but the flavor is totally different, and to my way of thinking makes the dish a little ordinary. One solution, if it proves impossible to find is to grow epazote from seed in a pot on a sunny window ledge. The seeds can be obtained from several companies. I use Redwood City Seed Co., Box 361, Redwood City, CA 94064 USA, because they also stock a large number of unusual hot red and green chile seeds. Kennedy recommends using the tripe known in Yucatán as toalla (i.e. towel) for this recipe. It is relatively easy to find because it comes from the second stomach adjacent to the honeycomb tripe. When selecting tripe look over the pieces on offer. Many large pieces of honeycomb tripe come with toalla attached. As the name suggests, it does not have the deep honeycomb texture, but instead looks like a rough towel. Note also that this dish takes at least three days to prepare, so plan ahead. Cut the tripe into 1″ squares and place them in an earthenware bowl. Pour the sour orange juice over the tripe and let it marinate overnight in the refrigerator. (Next day) Place a heavy (ungreased) iron skillet on high heat until it is hot and ready to smoke. Place the unpeeled garlic cloves in the skillet and agitate them gently until they are nicely charred on all sides. Remove the garlic and repeat the process for the oregano (being careful not to blacken it too much). Finally, do the same for the hot green chiles and set them aside. This toasting process is absolutely essential to get the authentic “burnt” flavor in the broth. Put the calf’s foot (or marrow bones) in a heavy saucepan with 6 cups of water (or beef stock if you prefer a more heavily flavored soup). Add the toasted garlic and oregano. Bring to a boil and gently simmer covered for one hour. At the end of the hour add the tripe and the sour orange juice marinade. Bring the pot back to the boil and simmer for another hour or until the tripe is tender. Because of the marinade the cooking time is difficult to calculate. In theory the acid marinade is supposed to tenderize the tripe; but I find that it actually takes longer to cook it to the al dente stage than without it. Once the tripe is tender to your taste, cool the pot and refrigerate overnight. (Next day) A great deal of fat from the tripe and calf’s foot will have congealed and hardened on the surface of the broth. Skim all the fat off and then return the pot to a gentle simmer. Remove the calf’s foot when it is warmed through. Take out and discard the bones, and roughly chop the meat, fat and skin. (If you are using marrow bones, extract the marrow and chop it, and discard the bones). Remove the tripe from the broth and keep it warm along with the chopped meat from the calf’s foot. Chop the toasted green chiles. Heat the cooking oil on high heat in a heavy skillet. Add the onion, green pepper, and green chiles. Cook until the onions start to take on a little color. Add the chopped tomatoes and cook for a few minutes longer. Add the annatto and two or three tablespoons of the broth from the tripe. Stir until everything is well mixed and heated through. Add this mixture to the tripe broth, and then return the broth to a simmer. Traditionally the broth is served in bowls to each diner, with a plate of tripe and calf’s foot as an accessory. Large bowls of the garnishes are set on the table to be added to the broth as people please. Big hunks of crusty bread are a common accompaniment as are flour tortillas. You may also simplify things by serving the meat and broth together as a big hearty soup (again, to be garnished as one pleases).